Pullmantur began cruise operations in the 1990s by initially selling cruises on board SS SeaWind Crown, founded by Anastasios Kyriakides (subsequently merged with Premier Cruises), in the Southern Caribbean from Premier Cruises and later also on board Premier Cruises flagship the SS Rembrandt in the Mediterranean. After Premier Cruises changed their business plan in 1997 and decided to cancel their contracts with operators such as Pullmantur and their following collapse in 2000, Pullmantur acquired their SS Big Red Boat 1 and started their own cruise line, Pullmantur Cruises. The Big Red Boat 1 reverted to her original name SS Oceanic and begun cruising around the Mediterranean from Barcelona in May 2005. The Oceanic became hugely successful, and already in 2002 Pullmantur acquired a second ship, MS Pacific (formerly Princess Cruises' famous MS Pacific Princess that starred in The Love Boat TV series), and chartered the former Renaissance Cruises ship MS R Five from Cruiseinvest. The R Five was marketed under the name Blue Dream. Two more ships followed in 2003. Pullmantur acquired MS Superstar Aries from Star Cruises and renamed her MS Holiday Dream, while the R Five's sister ship MS R Six was chartered under the marketing name Blue Star. In 2004 the R Five was chartered by her owners to Oceania Cruises. In 2005 Pullmantur purchased the R Six, confusingly renaming her MS Blue Dream. A third R-class ship followed in 2006 when Pullmantur bought the Delphin Renaissance and renamed her MS Blue Moon. Later the same year the Pullmantur fleet grew to six ships when the Pacific Sky was purchased from P&O Cruises Australia and renamed SS Sky Wonder. A few months after the purchase of the Sky Wonder the entire Pullmantur company was sold to Royal Caribbean Cruises Ltd. 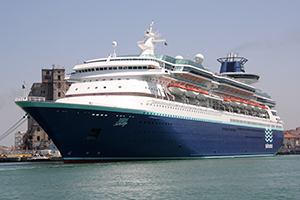 Following the acquisition by Royal Caribbean, several transfers were carried out between the Pullmantur fleet and those of other Royal Caribbean brands. In 2007 the Blue Dream and Blue Moon were transferred to Azamara Cruises, while MS Oceanic II and Celebrity Cruises' MS Zenith joined the Pullmantur fleet in their place (the Oceanic II only spent the 2007 summer season sailing for Pullmantur). In 2008, Pullmantur received Empress of the Seas from the fleet of Royal Caribbean International and renamed her MS Empress. The Pacific and Holiday Dream left the Pullmantur fleet in April/May for Quail Cruises and CDF Croisières de France, respectively. The former P&O Cruises Australia ship Pacific Star entered service as MS Ocean Dream in May. RCI's MS Sovereign of the Seas transferred to Pullmantur as the MS Sovereign. In April 2008 Lloyd's List reported that Pullmantur were also in the process of purchasing MS Pride of Aloha from Norwegian Cruise Line's subsidiary NCL America. The deal fell through, however, and the Pride of Aloha returned to the "normal" Norwegian Cruise Line fleet instead. In March 2009 the Oceanic was sold to Peace Boat and the Sky Wonder was renamed Atlantic Star in April 2009. In mid-April 2009, the Island Star was transferred from Island Cruises to Pullmantur Cruises. It was announced on March 20, 2012 that Royal Caribbean International's Monarch of the Seas will be transferred to the fleet on April 1, 2013. The Ocean Dream was chartered to Peace Boat to replace the Oceanic, the Pacific Dream/Horizon was transferred to CDF Croisières de France. In 2014, the Zenith joined her sister ship L'Horizon sailing under the CDF Croisières de France brand. On October 22, 2015, it was announced that Empress will be transferred back to Royal Caribbean in early 2016. In late 2016, it was announced CDF would cease operations in early 2017. Both ships will be transferred back to Pullmantur. Between 2001 and 2008 Pullmantur ships ran in a variety of liveries. All ships had Pullmantur's logo depicting arrows across a globe on their funnels and the company name and logo on their hulls, but the colors of the funnels and hulls varied from one ship to another. SS Oceanic, SS Sky Wonder, MS Oceanic II and MS Zenith were painted with a white hull and blue funnel, MS R Five, MS Blue Dream and MS Blue Moon with a black hull and white funnel, MS Pacific with a white hull and white funnel, and MS Holiday Dream with a white hull and blue funnel with red stripes. In 2008 the company changed livery to a white circle with a red letter ñ on it. Coinciding with this the ships were painted in the new livery with a red funnel and a white hull, with the word "Pullmantur" written on the hull towards the rear in small letters. In 2012/2013 Pullmantur changed livery into a blue hull and blue strip type. The first ship to receive the new livery was the Empress, which now has a blue hull and blue funnel, and Pullmantur's new logo, followed by the Sovereign. Also in December Horizon returned to Pullmantur Cruises for a 2-month service and also received the new livery but without Pullmantur logo on it. 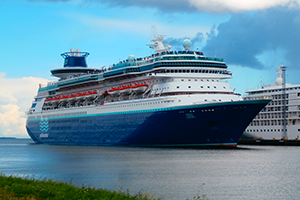 All ship in Pullmantur will be changing liveries. 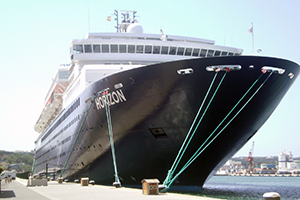 As of early 2013 the Empress, Horizon, Sovereign, and Monarch have received the new livery, with the Horizon getting the Pullmantur logo on her funnel. However, the Zenith still kept the old red funnel / white hull logo. In mid-2013, the Zenith received the blue funnel but kept her white hull / old logo. In late 2013, the Zenith received the new logo but still kept her white hull. As of early 2014, the Zenith has received the livery to match the rest of the fleet. 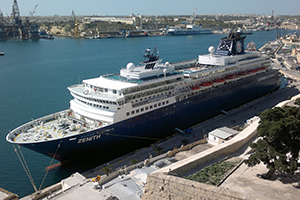 In 2014, the Zenith has transferred the CDF Croisières de France brand but she and Horizon both returned to the Pullmantur brand in 2017. MS Sovereign. Built: 1988. Entered service for Pullmatur: 2008. Capacity: 2852. Gross tonnage: 73,192. Transferred from Royal Caribbean International in November 2008. MS Monarch. Built: 1991. Entered service for Pullmatur: 2013. Capacity: 2852. Gross tonnage: 73,192. Transferred from Royal Caribbean International in April 2013. MV Horizon. Built: 1990. Entered service for Pullmatur: 2009/2017. Capacity: 1875. Gross tonnage: 47,427. Previously Horizon, Island Star, Pacific Dream. Sailed as CDF Horizon from 2012 to 2017. Identical to the Zenith. MV Zenith. Built: 1992. Entered service for Pullmatur: 2007/2017. Capacity: 1774. Gross tonnage: 47,413. Previously Zenith. Sailed as CDF Zenith from 2014 to 2017. Identical to the Horizon. Is Royal Caribbean Cruises Ltd. Going To Sell Its Old Cruise Ships?